Cassandra Strings carries a complete selection of accessories for the orchestral and band instrument player. We have everything from cases and bows to reeds and mutes! 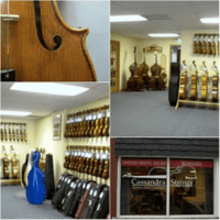 Cassandra Strings also specializes in quality Violin, Viola, Cello and Bass sales from the beginner to the professional. Our inventory includes a wide range of instruments from Germany, France, Italy, Czech Republic, Romania, and China as well as from US makers. We carry selections of both new and restored instruments that fit any budget. We also have access to new instruments not in stock from makers around the world. Your selection is not limited by what we have in stock. You can even get help finding the right size, brand, and price range for any player, with any level of experience, from our expert sales staff. We ship most orders within 24 hours Monday through Friday, excluding Holidays. We ship "Best way" via UPS ground or Priority Mail. If a problem does occur, please contact us immediately. Please inspect your package immediately for damage! We want to make sure that your shipment arrives safe and sound. Due to the the fragile nature of instruments, A $15.00 handling fee will be applied for all violins and violas and their cases purchased, $30.00 for all cellos and their cases, and $90.00 for all bases and their cases. A $15.00 handling fee applied to all bow purchases. Instruments can only be shipped to continental U.S. addresses. Sorry, No PO boxes. Please note: INSTRUMENTS, BOWS AND CASES do not qualify for free shipping. Additional charges also apply for specific over sized and/or heavy items. See the "Special Domestic Shipping Exceptions" section for details. Insurance can be purchased for your order as 10% of your total order price. There is an additional handling charge for each instrument, instrument outfit or instrument case ordered due to packaging size or value. String Basses will be shipped by commercial truck and will always require a shipping quote and wll be charged according to current freight rates. A shipping quote will be sent to you within 2 business days of your order. Orders with a shipping quote will not be delivered on Saturday. Orders that are oversize or extremely heavy may incur shipping charges. You will be notified of any additional shipping charges by email before the order is processed. Products can be returned within 30 days of receipt of the shipment. After 30 days no products can be returned. Strings and music cannot be returned unless an error was made in the shipment. Please call (847) 458-7386 to obtain a return authorization number before returning. If an item is returned without a RMA number, your refund will be delayed, and up to a 15% restocking fee will be applied. All products must be returned in brand new condition with all accessories and packaging. Please use a reputable shipping service with a way to track the package. Cassandra Strings, Inc. is not responsible for returns lost in transit. Because we cannot guarantee the fit of an instrument or bow in a case, we will not be responsible for return shipping if an item does not fit your instrument or bow correctly. Cassandra Strings, Inc. does not pay for return shipping unless an error was made in the shipment.